The Khourys are a classic immigrant success story: a Lebanese family who carved their slice of the American Dream by becoming the largest distributors of vending machine sandwiches in the upper northern Midwest. Unfortunately, the Khourys' gains have been ill-gotten, and a branch of the Chicago Irish Mob has come back to collect a past debt. Fealty is demanded, shots are fired and long-hidden family secrets are fully revealed. Now Dorothy Khoury, the daughter of the family patriarch, is forced to unite her splintered bloodline and fight back. 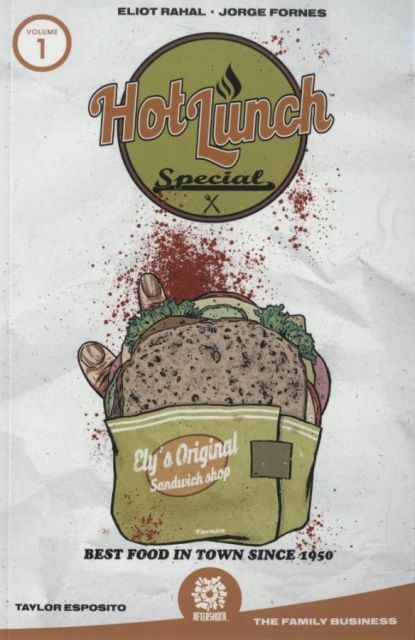 Written by Eliot Rahal (Cult Classic, The Paybacks, Quantum & Woody) with art by Jorge Fornes (Amazing X-Men, Wolverine, Magnus), HOT LUNCH SPECIAL is a midwestern noir series about family, food and the fight for survival. Volume 1 collects the entire Khoury saga, issues #1-5.